The Apple App Store is now available in 155 countries and in more than 40 languages. The Google Play store is available in 152 countries and in 77 languages. It’s obvious that if your app store only caters to a Tier 1 market or simply one country/language, you’re not taking full advantage of this global reach and your app’s distribution potential. With a localized and culturalized app store, the potential CVR lift is simply too big to ignore. After analyzing over 500M user sessions on the Apple App Store and Google Play, we have identified the potential impact of localization and culturalization, and crafted a list of best practices to help guide you in increasing global visibility and boosting conversion rates (CVR). 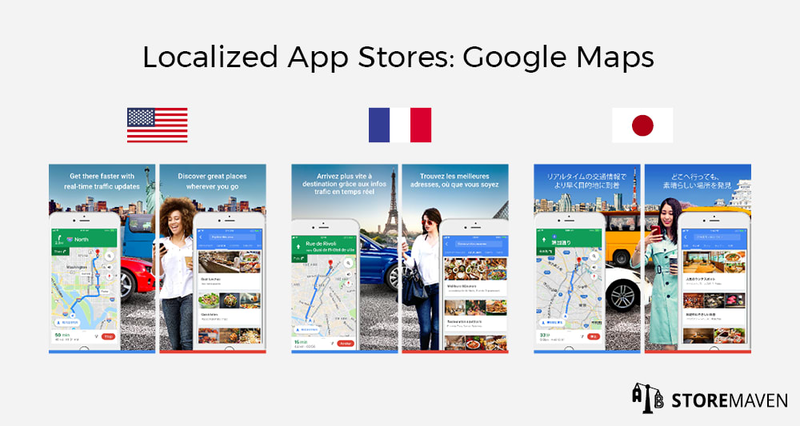 In the Google Maps example above, you can see localized app stores for the United States, France, and Japan. Notice how they used the same exact messaging, features, and design but in different languages, and with different models and cities. Simply put, app store localization is the process of adapting an app store’s metadata (i.e., app name, description, keywords, and screenshots) to different countries and their languages. In the Apple App Store, you can localize your app’s metadata for 28 different languages and locales. In Google Play, you can localize your app’s metadata strictly by language and there are 77 different languages options. 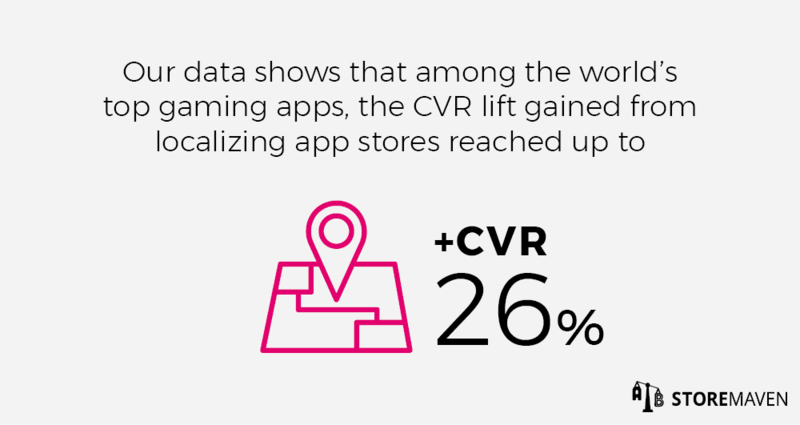 Our data shows that among the world’s top gaming apps, the CVR lift gained from localizing app stores reached up to 26%. This is by far your lowest hanging fruit. That is, by simply translating your app store metadata into different languages, you can increase your impression to conversion rate. Research languages & locales to localize for: Use services like App Annie, Sensor Tower, and Mobile Action to track your competitors’ localization efforts and track the localization efforts of top apps in your category. Identify locales where there is good market opportunity. Locally relevant translations: Solicit translation services, ideally from translators that are from the locale in question and with copywriting experience. Make sure the underlying message you are trying to convey is adapted to local usage and jargon to avoid linguistic friction. Literal translations can be problematic as idioms and jargon often get lost in translation. Cross-check translations: If you have the resources, it’s best to cross-check your translations with other local translators and even with local people. For example, you can send your translations through Fiverr to be proofread by a local person and ask for added cultural points to ensure that your copy is locally appropriate. Test: Not all localized content works, which is why it’s important to test all localized metadata. For example, one of our clients saw a localized app title lose while other localized metadata won. This proves that while understanding messaging is important, in certain countries English can give validity to a brand. 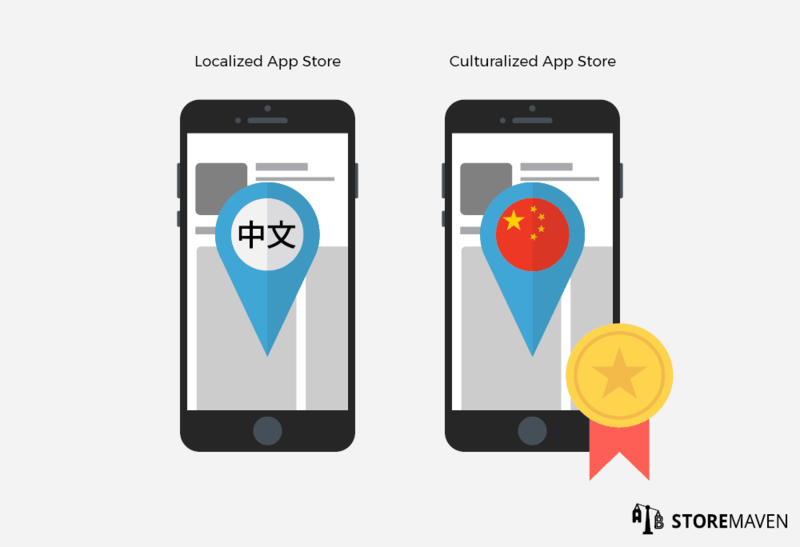 It’s one thing to localize your app store—forgive the idiomatic pun—but it’s a whole new ball game to culturalize it! What is App Store Culturalization? 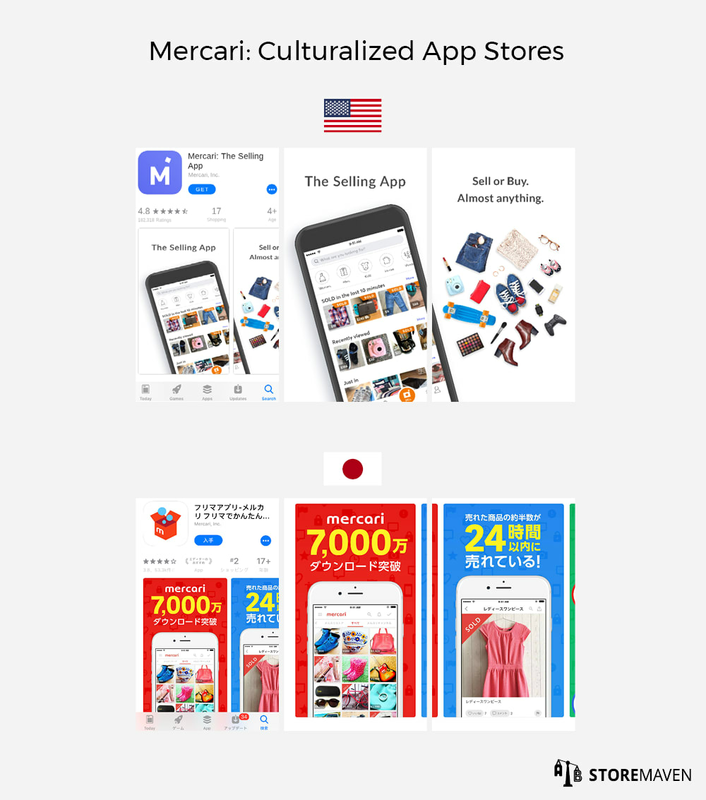 In the Mercari example above, you can see localized app stores for the United States and Japan. Rather than a simple translation, these stores are completely different. Simply put, culturalization is the process of creating a custom app store for a different locale/language based on that region’s unique values and beliefs. While localization allows app store users to find and read app store metadata, culturalization offers users a chance to connect to your app store on a more meaningful level. More importantly, culturalization ensures that visitors to your app store will not be turned off by a piece of content that is considered dissonant or even offensive to their culture. Culturizing your app store requires more resources—but it’s totally worth it! In a vast majority of the tests we have run that included both a translated app store variation and a culturalized app store variation, the culturalized variation won. This goes to show that there is an even higher CVR potential for culturalizing app stores. Competitive app research: In addition to tracking your competitors’ localization efforts and the localization efforts of top apps in your category, explore their culturalization strategies. 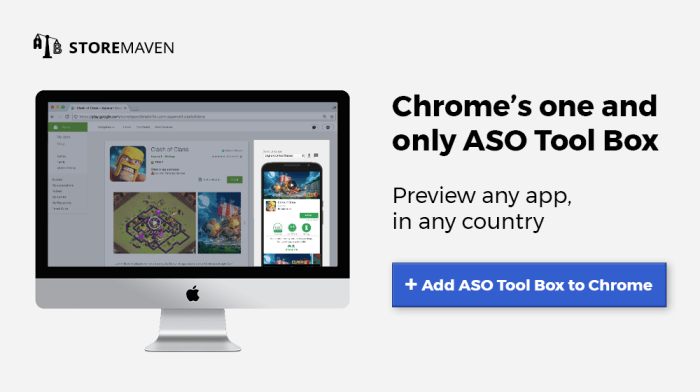 Use the ASO Tool Box Chrome extension to preview and download all app store marketing assets of any app, in any country, and in any language. Identify locale trends in terms of content and creatives. Dig deeper: Research the local culture, customs, history, religions, belief systems, etcetera. Dig even deeper into your target age and gender. And then try to go even deeper, try to uncover the specific (and likely divergent) needs and motives of your users in different locales. For example, we’ve seen that different features of an app are popular in different locales and we’ve even seen different user motivations. These divergent motives and interests require different messaging—and this is what successful culturalization is all about. Identify cultural problems (before they arise): Try to identify cultural issues within current app store content and creatives, and identify other plausible issues that could arise. Representation: Research and brainstorm culture-specific content and imagery that can be incorporated into app store metadata. If you cannot find good competitor examples, explore television or print ads to see how global brands advertise to the local population. Be cognizant of stereotypes of the locale in questions and avoid making decisions based on what you think you know about that locale and more on what you discover about marketing in that locale. Fact check: Gain additional awareness by communicating with locals and bouncing ideas off of them. Turn to locals for any kind of linguistic or cultural dubiety. Test: Although culturalization tends to win over basic localization efforts, we have seen some cases in which localized variations have beat culturalized variations. Product awareness, messaging, and how globalized the locale in question is can all play a role in how culturalized app stores will be perceived. For example, we have seen certain countries in western Asia respond better to westernized screenshots than screenshots with local representation. The point is, you simply won’t know without testing. The basic idea behind app store localization and culturalization is to make your app store content legible and meaningful to people across different regions and linguistic backgrounds. Our data proves that the potential impact is substantial. And yet many developers are still missing out on the opportunity to grow their app globally and boost CVR. Don’t be one of them. If you have questions on where to start, feel free to contact us at info@storemaven.com.